An economic crisis is something that affects every spectrum of life, and this includes the fashion industry. There are several examples that show us what happens in the fashion world during a time of crisis. There are even theories related to our attitudes towards clothing when the economy takes a bad direction, such as the “hemline theory” where the length of the skirts women wear are used as predictors of the direction of the stock market. In the past year, the world has experienced and economic climate as unstable as a pre-pubescent girl’s temperament, and this climate has been reflected in the trends we have spotted both on the runways and on the streets. The recent economic crisis divided fashion lovers in two very evident groups: those who resorted to minimalism as a way to appear modest, and those who resorted to opulence to protect their status. The latter group is the one responsible for our generation’s obsession with brands and logos and the importance placed upon luxury products, services and experiences. They can easily be identified because of their “Balmania” and overall obsession with “bling.” I use Balmain as an example because it is a brand that is well-known for its opulent designs and excessively ornamented or “blinged-out” garments. Therefore it is appropriate to associate this brand with people who in a time of crisis decide to be flashy in order to affirm their status. These people are easily spotted because they dress in more high-end brands than high-street ones and make sure that the garments they choose have visible and well-known logos, as if to say: “What crisis? I can still afford this.” To them we could also attribute the world’s fascination with “it-girls” and over-the-top lifestyles. The epitome of these aforementioned Balmaniacs (people who are obsessed with demonstrating that they have money) are The Kardashians, who have become a pop-culture phenomenon among the world’s youth because they portray a lifestyle to which most people in the world can only aspire to. The Kardashian girls as well as other “celebrities” like Paris Hilton have become a household brand simply for sporting their last names. They are not the conventional celebrity who is glorified for fictitious roles in award-wining movies or platinum selling music albums. They are more famous for being than actually doing, feeling they are entitled to this fame because of who their parents or grandparents are. The worst part is that their fans choose forget that in order for them to have these extravagant lifestyles they admire so much, their ancestors had to work really hard. This trend of being a celebrity simply because you have the right look or name, has also become popular in the fashion industry with the large amount of street-style stars and personal style blogs. These blogs have become as important as the top selling fashion publications due to their large readership. Those who read them do so because they are sold the illusion that these writers are just like them, only with the great fortune of owning expensive wardrobes. In reality, most of these bloggers are endorsed by the brands they wear and promote. The clothes they wear are sent to them by designers, who use these girls as a guerilla-marketing tactic. This defeats the purpose of a personal style blog, since just like a model these girl’s outfits are styled by professionals rather than themselves. When these celebrities and street-style stars get a hold of social media, a thirst is created to not only strive for status but also a need to document it. This group can no longer do things just for the sake of it; but they have to show the world they did it as well. It’s a group of people so hedonistic, self-involved, self-obsessed and shallow that they consider themselves celebrities simply because they have hundreds of followers on Instagram and “this many” likes in their picture with their Celine luggage tote. Social media has also been responsible for our generation’s thirst for attention, which is achieved by posting pictures of your most glorious moments for the world to see and declaring yourself and “Social-Media celebrity” and living with a heightened sense of self-importance. These groups of people are those who only watch TV shows like “Gossip Girl” or “Downton Abbey” because they tell the stories of a very thin upper layer of society rather than regular people living regular lives. Coincidentally these two shows have some of the most expensive wardrobes in the history of television. Gossip Girl, the show about Manhattan’s elite, has influenced our desire for wealth and brands because the kids who watched it are now young adults who have become obsessed with owning the products they see on the show, even thought they may not have the acquisitive power to buy them. These characters can be found mostly in the 25-and-under age group, since they are a generation that didn’t experience war and grew up in abundance, with access to luxuries unknown by their ancestors. It would be and over-generalization, however, to say that this has been the entire world’s reaction to our economic climate. This analysis only refers to a sector of the population who have either come across their wealth very recently and feel the need to buy anything that equates to status, or have been affected by the crisis but wish to hide their struggle. However since they are the ones who are flashier and “noisier” because of their opulence, they are the ones who are more easily identified. The stronger trend we have witnessed in past years is a collective effort from high-end brands to improve the quality of their products in order to avoid disposability and justify the high prices customers pay for their brand. 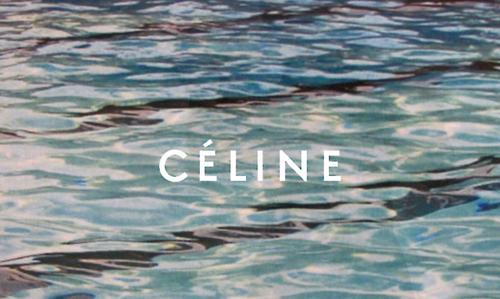 In such fashion, Celine’s Creative Director Phoebe Philo has made it her mission to rid the brand of disposable products by resorting to minimalism in recent collections, so the clothes don’t go out of style so quickly. By designing functional clothing, Philo has not only boosted sales at the once-forgotten Celine, but has made it the brand of choice for the “power woman.” Her choice of cuts and colors in the past collections are to thank for the success, since Celine clothing is appropriate for both the office and everyday life, making buyers feel that it is a good investment when money is scarce. Taking a different perspective, Louis Vuitton saw the economic crisis as an opportunity to revive trends from other decades, such as the 60’s and the 70’s, in its “Voyage Dans Les Temps” collection. This was an effective move because even if you can no longer afford to buy Louis Vuitton, you can find similar garments in vintage shops or even your mother’s closet. This creates the illusion that even if you can’t buy a new garment, you can still be trendy. Another way to sell the illusion of luxury to those affected by the crisis has been the ubiquitous designer collaborations with high-street brands like H&M and Target. These collaborations provide people who normally couldn’t afford designer goods the opportunity to own the dream. However this all goes back to our generation’s obsession with looking expensive, which is the same reason why Herve Leger’s body-con wrap dress has been replicated by multiple high-street brands. People want to feel they own designers even if they are only designer collaborations. Like a lot of people who resorted to wearing their money during this crisis, a lot of people decided it would be better to hide their wealth. The BOBO trend (Boheme Bourgeois) is the epitome of wealthy people who dress like they don’t have money while wearing very expensive clothes. The leaders of this movement are Vanessa Bruno and Isabel Marant, who design derelict chic clothing that make one look homeless even thought one probably lives in a very expensive home. Marant has been an especially influential designer in the past few years not only because she incorporated military prints into her collections, which is characteristic of the fashion industry when the economy is bad, but also because she took a regular product and transformed into a luxury one. Marant’s luxury wedge sneaker served as a domino effect for transforming regular everyday products like sneakers and T-shirts into luxury items. Most people can no longer afford to drop thousands of dollars on a formal gown they will probably wear once, but they are willing to spend hundreds of dollars on a luxury sneaker that they will be able to wear multiple times. In their mind this represents a good investment since the utility justifies the cost. This creation has also influenced Stella McCartney’s “sport-fashion” and multiple collaborations with Adidas since people would now rather have expensive sportswear and casual clothing that they can wear more often. This crisis has made a lot of big fashion houses re-structure and re-strategize to retain profit, because they really need the money. They have been forced to make their couture lines more wearable because people stopped buying them. Dior was hit especially hard during the crisis, since it’s former creative director, John Galliano, created a reputation for the brand, of making only costume-esque clothing that was not fit to be worn in real life. After Galliano’s departure from the brand due to anti-Semitic remarks, Dior was forced to hire a new creative director to design more wearable clothes and give the brand a makeover. Just as Phoebe Philo revived Celine through minimalism, Raf Simmons revived Dior by creating neater silhouettes and paying more attention to the quality of the fabrics to avoid disposability. He also introduced a new gamma of colors such as brights, neons and pastels onto the Dior runways, an uncharacteristic move for the brand but one that helped increase Dior’s sales by 24 percent in 2012. This group of designers- Marant, McCartney, Philo and Simmons- were perhaps the main power players in the fashion scene over the past year. They influenced their surrounding fashion houses and high-street brands to utilize functional fabrics, implement visible seams, and pay attention to the garment’s cut, fit and proportion. Bad economies make us idolize anyone who is not affected by it, or who can sell us an illusion of better days. One can consider this a parallel between those who are spending a lot of money on labels to look rich, and those who still spend large amounts of money on clothes that don’t look expensive in order to appear low key. Either way, the economic climate and designer efforts to become more budget conscious have not prevented people from spending a lot of money. 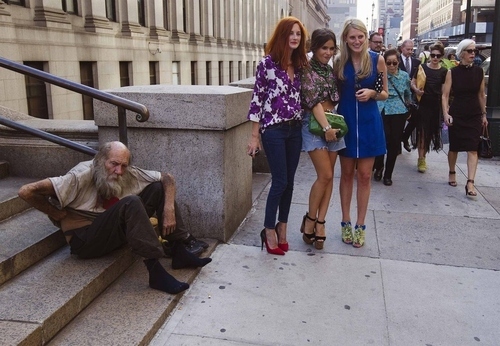 The economy marks an evident divide between those who wish to flaunt their wealth through a baroque, blinged out style of excess and flashiness, and those who have become more fiscally conscious. For the latter group, it is no longer about owning massive amounts of seasonal clothing that will go out of style in the blink of an eye, but rather about owning a carefully curated selection of high quality items. There are justified reasons behind the trend revolution we saw in 2012, it’s just a matter of choosing which “side” with which you most identify. I’ll post better pictures when I have them.